Scroll down to see the top not-for-profit colleges and universities in Maine offering online degree programs. The University of New England offers graduate degrees and certificates that can be completed entirely online. Online master's degrees are available in applied nutrition, public health, social work, health informatics, medical education leadership, and education with concentrations in career and tech education, curriculum and instructional strategies, educational leadership, inclusion education, literacy education, and reading specialist studies. Online graduate certificates are available in advanced educational leadership, public health and health informatics, and post-master's certificates are available in curriculum and instructional strategies; educational leadership; inclusion education; leadership, ethics and change; K-12 literacy, K-12 reading specialist/literacy coach studies; and career and technical education. Additionally, an online doctoral degree is available in education leadership. Online students at the University of New England are eligible for financial aid, primarily in the form of loans. Online students also have access to student support services such as virtual library access, writing support and academic advising. UMA Online ranked in the top 50 of U.S. News & World Report's 2017 list of best online bachelor's programs. The biggest major in terms of concentrations is Business Administration, followed by Computer Information Systems. Most of the 12 baccalaureate degrees also come in associate-level versions. One that doesn't, for obvious reasons, is the Bachelor of Applied Science - a general degree designed for transfers from the Maine Community College System. Mainers can travel to one of eight University College centers for additional support or to take exams. Saint Joseph's College of Maine offers undergraduate and graduate degree programs that can be completed 100 percent online. Online bachelor's degrees are available in business administration, education, health administration, health information management, long-term care administration, radiologic science administration, information technology, nursing and theological studies. Additionally, online students can earn a bachelor's degree in interdisciplinary studies with minors in 11 areas, including accounting, adult education and training, criminal justice, human services, psychology and senior living leadership. Online business administration students can also focus their studies in an area of concentration such as accounting, banking, management, sales and marketing management, or senior living leadership. Online master's degrees are available in accountancy, business administration, education, health administration, nursing and theology. Online education students can focus their studies in an area of concentration such as adult education and training, catholic school leadership, health care educator studies, K-12 school educator studies or school leadership. Additionally, the College offers 13 online certificate programs and several certificates of advanced graduate study. Online students at Saint Joseph's College have access to personal advisors, online tutoring and library services. Financial aid is available to online students. Online undergraduate students are eligible for Federal Pell Grants and the Federal Direct Loan Program, and online graduate students are eligible for Federal Direct Loans. USM Online offers undergraduates the opportunity to pursue the following degrees online: BS in Applied Technical Leadership, BA in Communication, BS in Leadership and Organizational Studies, BA in Liberal Studies, Humanities Track, BS in Business Administration, General Management, Generalist Track, and BS in Leadership and Organizational Studies, Integrative Professional Studies Track. There are three graduate online programs - MS in Adult and Higher Education, MS in Special Education and MA in Leadership Studies. There are also several undergraduate and graduate certificate programs available and hundreds of online courses are offered throughout the year. USM Online uses the Blackboard learning management system to facilitate communication between instructors and students in the online learning environment. UMaine Online offers two undergraduate degrees (Bachelor of Arts in Political Science, Bachelor of University Studies), four undergraduate minors (Labor Studies, Maine Studies, Peace and Reconciliation Studies, Political Science) and two undergraduate certificates (Peace and Reconciliation Studies, Maine Studies). In addition, there are 14 graduate degrees that can be pursued completely online, including an MBA, a Master of Education in Instructional Technology and a Master of Science in Information Systems. UMaine Online offers hundreds of online courses throughout the year and uses the Blackboard learning management system as well as Adobe Connect. It uses Cisco Jabber to allow students to connect to UMaine's video room, multi-point conference or external video conferences. The University of Maine Fort Kent offers a wide variety of associate degrees and bachelor's degrees that students can earn online. UM Fort Kent offers online students assistance such as an IT helpdesk and online library access. The university offers online associate degrees in allied health, conservation law enforcement, criminal justice, emergency management/homeland security, general studies, health information technology, and information security. Online students can earn a Bachelor of Science degree in accounting, business management, cybersecurity, health care administration, information security, or rural public safety administration. Students who major in arts and sciences, allied health, or who pursue the self-designed or undecided degree can earn a Bachelor of Arts and Sciences degree. The university also offers an RN to BSN program that allows working nurses with an associate degree or diploma in nursing to complete work toward their Bachelor of Science in Nursing degree through online coursework. Three certificate programs are also offered online: geographic information systems, health care management, and information security. The University of Maine at Machias offers three undergraduate degrees, several undergraduate certificates, and post-baccalaureate certification for special education teachers through online programming. The Bachelor of College Studies is an online degree program open to students who already have at least 45 credits. Students work with a faculty adviser to devise a study plan that matches the student's interests and career goals, such as business or a health profession. The Bachelor of Arts in Psychology and Community Studies allows students to perform fieldwork and internships where they live. Students in the online program can choose a concentration in applied psychology or disabilities in youth. The Bachelor of Science in Business and Entrepreneurial Studies allows studies to concentrate in accounting, management, marketing, sports and fitness management, business sustainability, or to create their own concentration. Certificates are available in entrepreneurship, human resource management, and marketing. Applicants who already have a bachelor's degree can enter an online program to gain certification to teach special education in Maine. Online learning in the Pine Tree State is often a public affair. Affordable programs are available across the University of Maine System (UMS). UMaine is working to attract new learners with its Think 30 initiative and E-Tuition rates. And public colleges & universities are part of a discount tuition break known as the Regional Student Program (RSP). For more on all these options, plus some advice on how to check for regional accreditation, take a look at our short guide to choosing an online program in Maine. The UMaine System (UMS) has a distance education arm called University College (UC), and UC has a website called Learn.Maine.edu. This site maintains a useful database of online degree & certificate programs available through UMS’s seven universities. The database includes all levels of UMS degrees (associate through to doctorate) and all methods of delivery (blended, web, interactive television, etc.). UC advisors are available to help online students with the admissions process. Trying to find a better job? UC has also partnered up with ed2go/GES to offer non-credit career training. These online, open enrollment programs are focused on a variety of high-demand careers (e.g. hospitality, healthcare, IT) and are often six months to one year in length. 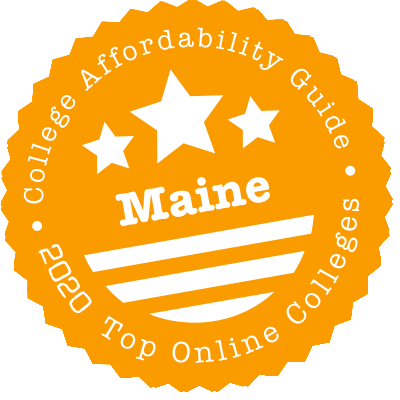 The Maine Community College System (MCCS) has a section on its online offerings, with links to online courses at all seven of Maine’s community colleges. A limited number of associate degree programs are offered completely online, including degrees that are intended to help students transfer to a four-year institution (e.g. Associate of Arts in Liberal Studies). The New England Board of Higher Education (NEBHE) has a tuition break program called the New England Regional Student Program (RSP). This allows residents from six states—Connecticut, Maine, Massachusetts, New Hampshire, Rhode Island, and Vermont—to enroll in discounted programs at out-of-state New England public colleges and universities. All UMS schools participate in RSP. According to NEBHE, the discount means you pay less than out-of-state tuition rates, but more than in-state. The RSP regional rate is usually based on a percentage (up to a maximum of 175%) of a college’s in-state rate. Some online degree programs are offered with RSP tuition rates—check with your prospective school for details. The following schools have the honor of appearing on both our “Most Affordable” and “Top Online” lists. That means they met our rigorous criteria for quality, flexibility, price, and use of financial aid money. (You’ll see a CAG Score next to their profiles in our ranking.) If you fancy more than one school, College Scorecard also has some useful financial statistics, including the percentage of students paying down debt within three years of graduation. UMaine Online is where you’ll find info on the university’s online degrees and courses, including details on tuition & fees. With a few exceptions, out-of-state students enrolled in fully online degrees or certificate programs are eligible for special E-Tuition rates. The page on Financial Aid & Scholarships has advice for undergraduates and graduates and a list of scholarship opportunities for online adult students. UMaine is the flagship university for the University of Maine System, and it’s heavily committed to distance learning. In addition to the Think 30 initiative that we mentioned, it has an online degree completion program for working adults called the Bachelor of University Studies (BUS). It also offers online courses to high school students through its Academ-E program. All Academ-E classes carry UMaine credit and meet the General Education (GE) requirements of UMaine. UMFK’s Distance Education website has a complete list of its online degrees & certificates, as well as info on ed2go non-credit courses. The site also has a breakdown of tuition & fees for online learners and links to scholarships and financial aid opportunities. Servicemembers should check out UMFK’s section on Veterans and Military; UMFK has been designated as a Military Friendly School by G.I. Jobs and one of the Best Colleges for Veterans by U.S. News & World Report. UMM has a full list of its Distance Degree Programs on its website, including details on its Special Education Teacher Certification and Psychology for High School Teachers Certification programs. Tuition & fees vary depending on residency status. But alumni get a special discount! Former in-state UMM students who now live outside of Maine may re-admit at the in-state rate to complete their program online. USM Online is the central hub for USM’s distance learning offerings, with details about its online undergraduate, graduate, and certificate programs. Its section on tuition & fees notes that Canadian residents and NEBHE/RSP students can qualify for reduced rates; online students may also be eligible for certain scholarships. If you’re coming from another school, there’s some helpful advice on transferring credits to an online degree (1/2 of all USM admitted students are transfers); the independent Office for Prior Learning Assessment (PLA) can assist with alternative credit options. Be sure your college or university is fully accredited by an organization recognized by the U.S. Department of Education. National accreditation applies to distance learning institutions, but regional accreditation is the gold standard, especially if you’re thinking of transferring credits or applying for financial aid. The New England Association of Schools and Colleges (NEASC) provides regional accreditation for K-12 schools and higher education institutions in New England, and its Commission on Institutions of Higher Education (CIHE) is specifically responsible for technical/career institutions, colleges, and universities. Check CIHE’s Roster of Institutions for your choice of college. CIHE’s page on Recent Commission Actions will also list if a Maine school has recently been put on probation or had its accreditation withdrawn because of quality concerns. Considering programs in other states? The Council for Higher Education Accreditation (CHEA) Database provides a full list of regional & national accreditations for every college and university in the country. Maine does not like diploma mills! Unlike states such as California, there aren’t many unaccredited schools lurking in the shadows. What’s more, the Maine Department of Education (DOE) maintains an alphabetical list of Non-Accredited Colleges & Degree Mills throughout the United States. If you’ve been approached by a school you’ve never heard of, check this list. New England Association of Schools and Colleges (NEASC): NEASC is the regional accrediting body for degree-granting higher education institutions in Maine. Use the Roster of Institutions to search for regionally accredited institutions by state. K-12 Approved Online Learning Providers: The Maine Department of Education (DOE) has developed the Maine Online Learning Program to provide K-12 students with high-quality distance learning options. This is its list of approved online schools (e.g. Connections Academy, Virtual Learning Academy, etc.). University of Maine System (UMS) Transfer Students: UMS has transfer guidelines for all kinds of learners, including adult students, veterans & military, and online students. You’ll also discover answers to FAQs and info on Transfer Course Equivalencies. University of Maine System (UMS) Online Program Database: Use this database to find online degree & certificate programs offered through any one of UMS’s seven universities—the University of Maine, the University of Maine at Augusta, the University of Maine at Farmington, the University of Maine at Fort Kent, University of Maine at Machias, the University of Maine at Presque Isle, and the University of Southern Maine.